Navigating a healthy dietary path through the holidays can be intimidating. So, as I sat down to sketch out what I would be serving my family, I decided to share my menu plan with you in hopes of saving you a little time and trouble. There are two ways you can use this menu plan. Simply use it as a collection of recipes and make the full dishes whenever you like. Or follow the menu plan the way I am, making a base recipe and using it for 3 days. Why not give your ideal woman (that bitchy chick who lives on your shoulder offering play by play judgements on everything you do) a winter vacation. That is what I do so that I can give up on the concept of having every single part of every meal prepared fresh and hot. Let’s cheat a little. Get ahead by preparing dishes in advance. In this menu plan, grains and root veggies are cooked and enjoyed fresh the first time we prepare them. In subsequent nights, we add in as much fresh stuff as we can. It maintains our healthy lifestyle and our sanity. Those of you who know me from Rocking Body Raw Food might be shocked to find hot, cooked dishes for dinner each night. This doesn’t mean that I have given up on persuading you to eat fresh, raw cuisine. Its just that this time of year cooked foods seem to fit in well and nurture our bodies- so you will find what I think is a balanced mixture. This menu plan is my way of thanking you for being a part of the community, for all your comments, emails, and calls. My holiday wish is for all of us to be Healthy Happy Hotties in 2013! To support that goal, I’m offering a new monthly class covering a different nutritional topic each month with recipes and preparation methods that support each subject. We will cover hormonal health, supporting our skin, cleansing, and more. We will also cover a mental/emotional aspect of health and a fitness routine that is aligned with the monthly topic. I hold the classes live in San Diego the first Saturday of every month from 11am to 2pm. You can sign up for the January class here. The classes will also be available via video along with additional recipes, bonus topics, and an interactive community when you register for Healthy Happy Hotties. Healthy Happy Holidays and a brilliant New Year to you! YUMMY! 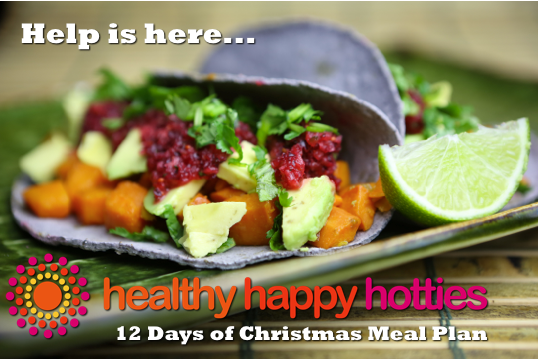 Thanks for the recipes Queen Healthy Happy Hottie – those Sweet Potato Soft Tacos look incredible – can’t wait to sink my teeth into them. 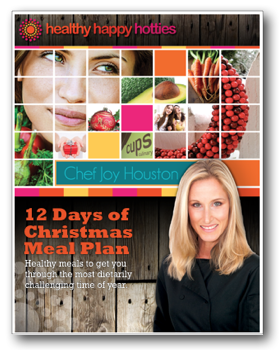 Thanks for the healthy culinary inspiration all year and look forward to seeing what 2013 brings! You are so very welcome Ryan. We ladies appreciate having a male healthy, hottie in the conversation here. It’s a smart guy who hangs in the cyber environment with hot chicks. If you were single we would auction you off to the highest bidder. Give your hottie a squeeze for us.